When I read this it made me think of my sister Sue, who I have written about before but since it is her birthday today, she is turning 44 I thought I would write about her again. Sue seems to me to worry about what others think of her and her decisions in life more then what is good for one. On our journey thru life we all will have times when we will wonder what others think that is normal but with Sue she seems to at times really feel she needs the approval of others in order to be happy. She will at times dwell on the past, worrying about past mistakes, worrying she will make the same mistake again all this has done is make her look older then her years. As I have mentioned before I am not a worrier, I like that my parents love Tim like he is a son but if any member of my family was to have a problem with him then it would be their problem it would in no way change how I feel about him or them. Yes you read that right it would not change how I feel about them because they are allowed to have their own opinion about things including Tim. 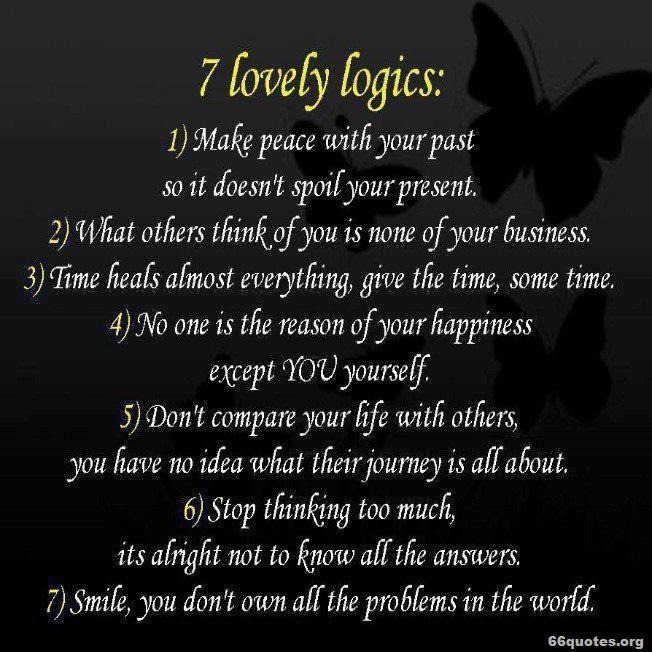 Maybe this is because I know my husband better then anyone else and I love him heaps more then words can express. But this post is about Sue not me so let’s go back to her, as I have may have mentioned she is a bloody strong woman because she hasn’t had the easiest life and yeah most of the mistakes she made herself but that doesn’t change the fact that her life has been hardish. Sometimes she has implied she is not happy with her life but there is nothing anyone else can do about that, she has times when she feels why do I bother to get out of bed. I can’t say I really understand, it is like I do understand but I don’t because I don’t have time to stay in bed. I have children and grandchildren who need me to do stuff for them along with all my online friends. I do feel at times that if she was to get up and dressed and did stuff she might feel happier, ok I get that she has no car but she does have working legs so she can get around maybe if she was to get up and help mum with the housework every day she wouldn’t feel so down and miserable all the time. Sue has 4 wonderful children and 4 wonderful grandchildren and she always says she misses them and doesn’t see them enough but sometimes sis you have to make an effort to see them. Do you lay awake at night worrying over things that have happened during the day? 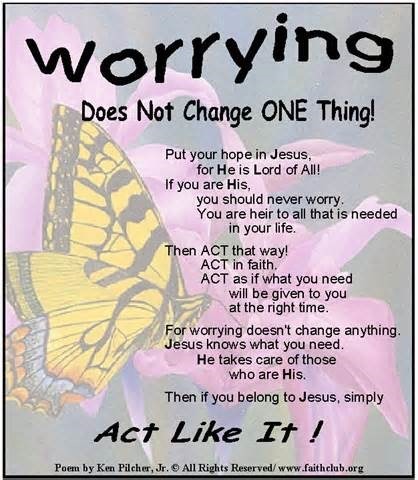 I am not a worrier, I can’t see the point in it, I have never laid awake worrying about things I have no control over, hell I don’t even worry about things I do have control over. At the end of the day I go to bed and I leave my worries out in the lounge room. Worrying will not change anything so I try not to do it, of course I do worry about my children but not unduly, I have raised them to the best of my ability and now I can only trust that I have in fact done a good job and they will continue to make wise decisions. I also worry about my niece Kelli and great nephew Daemon not having a proper home, but there is nothing I can do to change it, so I do not spend my nights worrying about them. I do pray and ask God to watch over them and keep the safe and to give the guidance as they face each day. Life is to be lived and enjoyed and worrying over things that a person is unable to change or do anything about is silly, trust in God to guide you and your love ones down the right path in life. Well that is what I do. Do you believe in angels in general? I do, I don’t know why I do, I just do, I believe someone is watching over me trying to protect me from myself and from other things not good for me. I say tying to protect me since I think it is impossible to fully protect someone from themself. God gave us freewill and in doing so to away the ability to fully protect us, but he has assigned each and every person a guardian angel. 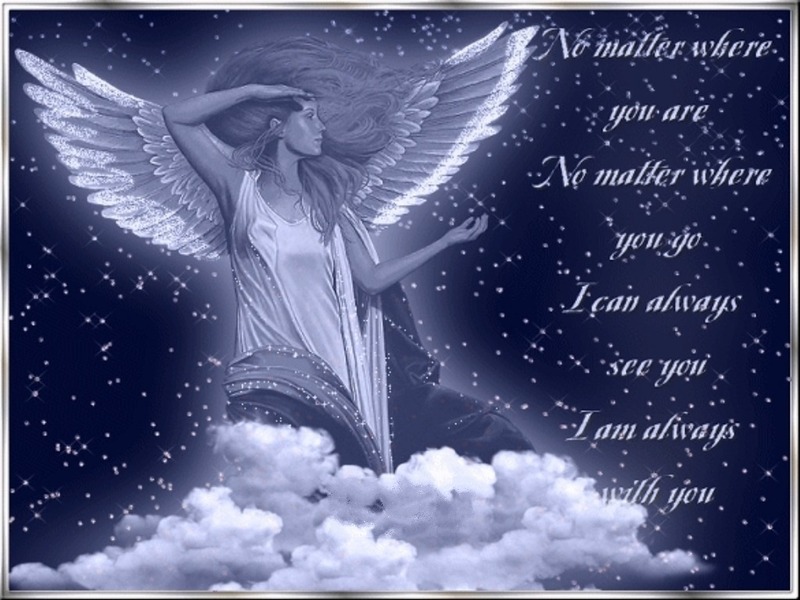 I believe our guardian angels are with us when our time on earth comes to an end, they are with us when we are suffering and try to guide us and point us in the right direction if only we would listen. So many people do not listen, they don’t believe in not believing they find it hard to hear what their guardian angel is trying to tell them. When we pray the answer to our pray may come via our guardian angel. Yes we have a birthday in the family my sister Sandra who I often call my baby girl is turning 36 tomorrow, were has the time gone. I can remember my dad turning up at my grandparents place around midnight 36 years ago to tell us that mum has had a baby girl. Sandra was born at 10.03pm weighing 6lb, I was so excited to have a baby sister as at the age of 15 it felt like she was my own little baby, which is why I guess I call her my baby girl. Sandra and I have always had a close and special relationship, at night would come in and get into bed with me or if not during the night she would come and get into bed with me first thing of a morning. She used to love to baby with my hair. When Sandra and David were only little I use to push them in a large old pram that mum had around to the corner shop with me and when I would go shopping at the local shopping centre I would also take Sandra with me. There was this woman who worked on the door of Kmart who for many years thought I was in fact Sandra’s mum. 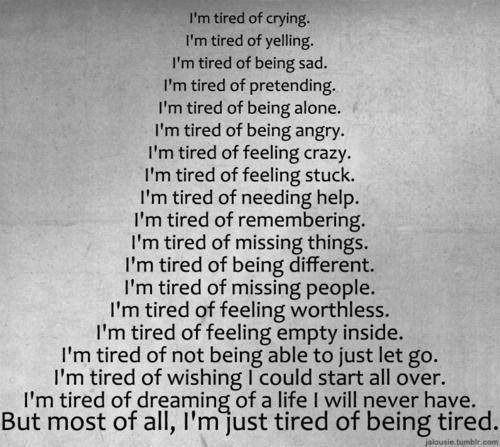 I so get this I have spent a lot of my adult life feeling tired, I know it is part of being a parent all parents are tired and we all get tired of being tired at times. I hate it when my daughter rings me in tears because she is so tired and feels like she just can’t do it any more and needs a break, or some sleep. I know I am not great at going over there and helping her out, I like my own house and prefer to watch my grandkids here in my own home, maybe that is selfish of me but it is how I am. I doubt I will ever change, although as I said to Kathy today if she didn’t have to come out this way to go to work I would go to her place and watch Summer while she is at work but that is not the case she works only 10 minutes from me and as such she has to come out this way to go to work so she drops Summer off here and I watch her while she is at work. When my girls where little I had no one to help me, know one came here to watch them while I did the housework, it was all me and even though Tim was a great husband and father when the girls where little he didn’t do a lot. He would get home from work and often not feel like doing anything much, he would watch the girls while I had a bath in the evening and in fact I think that is why back then I would have half hour baths it was the only time during the day that I got any peace. So I had many years that I would feel tired of being tired but it was just the way it was and I just had to deal. Yes there were many times when I would sit in the hallway crying because I was so exhausted and it all felt so hard and I just wanted a break. I remember saying out loud “I can not endure any more” then I would cry for a bit. The I would get up and carry on because that is what I had to do. It was just the way it was, once a girl became a mother she was the one expected to do everything, look after the kids, take care of her man, do all the housework and all the cooking and I am sure many women would get totally exhausted and would feel that it was all just so hard. Ok who in the American Republican party was watching the West Wing and thought the episode “Shutdown” would be a good idea to have happen in real life. In season 3 of the West Wing there was an episode called “Shutdown” While negotiating the federal budget, congress reneges on a deal for a continuing resolution to keep the federal government running. Bartlet refuses to concede to the Republican’s demands and the government is sent into shutdown (all nonessential employees to leave work), which lasts for several days. This from what I have heard on the news and have read on Yahoo’s home page is what has happened for real in the U S, when I heard the news the first thing I thought of was that episode of the West Wing…………..
My dad is in hospital again with Pneumonia Sunday night my sister Sandra had to talk mum into ring the ambos for dad as he was unable to breath at first he thought it was serious asthma attack and didn’t want to go to hospital. It was the second night he had trouble breathing but nothing was helping, so Sandra thought he needed to go to hospital. Also last night just as I was thinking I would go to bed my niece Kelli rang and asked if I would be able to drive her and Daemon over to the hospital, he was sick throwing up and she rang the afterhours GP who said to take him over. However she had left her car seat in Jono’s car and had no way to get there so she rang me, of course I went and picked them up and dropped them off at the hospital.